The new Panasonic Lumix DMC-FX55 carries on the diminutive tradition of the FX series of digital cameras, measuring just 9.5 x 5.7 x 2.3 cms and weighing 143 grams. The FX55 squeezes in a 3.6x wide-angle (28-100mm) Leica DC optical zoom lens with a bright maximum aperture of f/2.8 available at the 28mm setting. The 8.1 megapixel Panasonic DMC-FX55 also offers a large 3 inch LCD screen, an optical image stabiliser, face detection and ISO 1600 at full image resolution. There's a new Intelligent Auto mode which automatically selects the most appropriate combination of settings according to the situation, without any user input required. We find out if the DMC-FX55 is a worthy addition to Panasonic's extensive range of stylish compact cameras. The Panasonic Lumix DMC-FX55 is an extremely compact digital camera, measuring just 9.5cms wide and 2.3cms deep, which means that you can carry it in a trouser pocket without noticing it. Panasonic have somehow fitted in a wide-angle 3.6x zoom lens equivalent to 28-100mm on a 35mm camera into this tiny body. Other models of this size typically have a 3x zoom lens that starts at 35mm or higher. The wide-angle lens makes this one of the more versatile compacts in terms of focal range, especially as it is coupled with Panasonic's Mega O.I.S system, which helps to ensure that the majority of photos taken in good light are sharp. If you're used to a standard 3x zoom lens which usually starts at around 35mm wide, then you will find that the lens on the DMC-FX55 provides an entirely new angle of view that can only increase your creativity. Take it from me, you won't want to go back to a "standard" zoom after using the 28mm lens on the FX55, especially as it still offers a telephoto setting of 100mm which is perfect for head and shoulders portraits. The DMC-FX55 is a well-built camera, with a high quality plastic body and controls. The camera's design is dominated by the lens on the front and the large 3 inch LCD screen on the rear. There is no optical viewfinder, which follows a recent trend in digital cameras, and this does make the camera a little difficult to keep steady at the telephoto end of the zoom, especially given the disappointingly slow maximum aperture of f/5.6 at the telephoto focal length. Panasonic have introduced a new joystick control instead of the more traditional navigation pad, which is a little unresponsive but generally pleasant to use. There aren't any other weak-points in terms of the DMC-FX55's design and build-quality - for once the battery compartment and SD card slot are both well implemented. As this is purely a point and shoot camera with no manual controls, the Panasonic Lumix DMC-FX55 is not overly complex in terms of the number of external controls that it has, just 8 in total. The majority of the controls are clearly labeled and common to most cameras. There's a clever dial on the top edge of the camera that lets you select the various shooting and scene modes, plus image playback. This dial is reminiscent of the type found on SLR cameras, and enables you to quickly change between the various modes. It does have one drawback - you have to keep switching between the shooting or playback modes, rather than just pressing a button to review your images whilst in a shooting mode, as on most other digital cameras (although the Rev button on the back of the camera provides limited playback functionality). Also found on the top of the camera are the on/off switch, zoom lever and the shutter button. On the rear of the camera is a new Func button, which is a very welcome addition, as it provides quick access to most of the principal creative controls, including ISO speed, image size, image quality and white balance (there are 6 settings in total). You can still access all of these options from the main menu system too. If you have never used a digital camera before, or you're upgrading from a more basic model, reading the easy-to-follow manual before you start is a good idea. Thankfully Panasonic have chosen to supply it in printed format, rather than as a PDF on a CD, so you can also carry it with you. The large 3 inch LCD screen is the only way of framing your shots, so if you have to have an optical viewfinder, look elsewhere now. There's a clever mode called High Angle, which essentially brightens the LCD screen when the camera is held over your head so that it is perfectly viewable, which is great for shooting over the heads of a crowd. The various icons used to represent the camera settings are clear and legible, although I was annoyed by the "Press LCDMode for 1 sec" message along the bottom of the screen, which is displayed whenever you press the Display button. 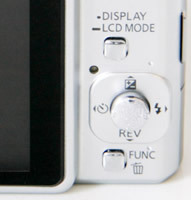 The main menu system on the Panasonic Lumix DMC-FX55 is straight-forward to use and is accessed by pressing the Menu/Set button in the middle of the navigation joystick. There are two main menus, Record and Setup. Most of the camera's main options, such as white balance, image quality, auto-focus mode and ISO speed, are accessed here, so the Record menu has 15 options spread over 3 screens. As mentioned previously, the addition of the Func button on the rear of the camera speeds up access to some of the more commonly used options. Due to the large LCD screen and restricting the number of on-screen choices to five, the various options and icons are clear and legible. Intelligent Auto Mode is a brand new addition to the FX series of cameras. Panasonic have tried to make things as easy as possible for the beginner by providing this new shooting mode, which allows you to point and shoot the camera without having to worry about choosing the right mode or settings. Intelligent Auto Mode automatically determines a number of key criteria when taking a picture, including selecting the most appropriate scene mode (from 5 commonly used presets) and ISO speed, and turning face detection, image stabilization and quick auto-focus on. In practice the new system works very well, with the camera seamlessly choosing the most appropriate combination of settings for the current situation. The 5 available scene modes are Portrait, Landscape, Macro, Night Portrait and Night Scenery, so obviously not all situations are covered by Intelligent Auto Mode, but it does work for the majority of the time. It's now possible for the least experienced photographer to easily take well-exposed, sharp pictures of people, scenery and close-ups by simply pointing and shooting the camera. As with all current Panasonic models, this camera has an anti-shake system, dubbed Mega O.I.S. Turn it on and the Panasonic Lumix DMC-FX55 automatically compensates for camera shake, which is a slight blurring of the image that typically occurs at slow shutter speeds when the camera is hand held. There are two different modes, Mode 1 is on all the time including image composition, and Mode 2 is only on when you press the shutter button. In practice I found that it does make a noticeable difference, as shown in the examples on the Image Quality page. You don't notice that the camera is actually doing anything different when anti-shake is turned on, just that you can use slower shutter speeds than normal and still take sharp photos. Thankfully leaving the anti-shake system on didn't negatively affect the battery-life, with the camera managing over 275 shots using the supplied rechargeable Li-ion battery. Panasonic also provide a High Sensitivity scene mode to help combat the effects of camera shake. When this mode is selected, the camera automatically raises the ISO speed to between 1600 and a maximum of 6400, which therefore allows for a faster shutter speed. This mode allows you to handhold the camera without using the flash and get more natural results, whilst at the same time freezing subject movement more successfully. There are some obvious drawbacks with this special scene mode, principally a significant reduction in resolution - Panasonic states in the FX55 manual that "The resolution of the recorded picture decreases because of high sensitivity processing. This is not a malfunction". You also need to select the scene mode and therefore have some idea about when it is applicable to your subject. You can see sample images using the High Sensitivity mode on the the Image Quality page. The start-up time from turning the Panasonic Lumix DMC-FX55 on to being ready to take a photo is fairly quick at around 1.5 seconds. Zooming from the widest focal length to the longest is a lot slower though at around 4 seconds. Focusing is quick in good light and the camera achieves focus most of the time indoors or in low-light situations, helped by the focus-assist lamp. The camera doesn't have any problems locking onto the subject in low-light situations. The visibility and refresh rate of the 3 inch LCD screen are perfectly acceptable, and the pixel count of 230,000 is fine too, with little visible grain. It takes about 1 second to store an image, allowing you to keep shooting as they are being recorded onto the memory card - there is no LCD blackout between each image. The Panasonic Lumix DMC-FX55 has a pretty standard Burst mode which enables you to take 3 frames per second for up to 4 images at the highest JPEG image quality. Overall the Panasonic Lumix DMC-FX55 is average in terms of operational speed. Once you have captured a photo, the Panasonic Lumix DMC-FX55 has a good range of options when it comes to playing, reviewing and managing your images. You can instantly scroll through the images that you have taken, view thumbnails, zoom in and out up to 16x magnification, view slideshows, delete, protect, trim, resize, copy and rotate an image. You can also select favourite images, sort images into categories, add a text stamp and set the print order. The Display button toggles detailed settings information about each picture on and off, such as the ISO rating and aperture / shutter speed, and there is a small histogram available during both shooting and playback. When taking a photo, pressing the Display button toggles between the detailed information, the histogram and gridlines to aid composition. In summary, the Panasonic Lumix DMC-FX55 is a very easy-to-use, fairly responsive compact camera that is particularly well suited to the beginner or anyone who requires a point and shoot camera. PhotographyBLOG is a member of the DIWA organisation. Our test results for the Panasonic Lumix DMC-FX55 have been submitted to DIWA for comparison with test results for different samples of the same camera model supplied by other DIWA member sites.